Daniel Hadida is an Ontario native and has cooked in some of Europe’s best kitchens before finding his way home. Hadida previously worked for eight months at Le Châteaubriand and a year and a half at Septime in Paris, two of the city’s hottest restaurants and trendsetters in the move away from the stodgy fine dining palaces of Paris’s past. Daniel met Eric Robertson when Eric was working at In de Wulf and they kept in contact, both being expat chefs over in Europe. After Daniel left Septime, he visited all the farmers that he worked with there, spending time on their farms – just working and learning. When Eric came back to Canada, he visited Daniel and knew they were looking to set up something similar, something a little rural – a destination restaurant. 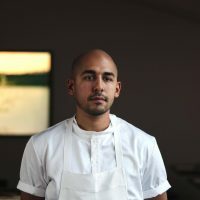 Both chefs take pride in serving fresh, high quality ingredients from small-scale organic farms, and ultimately, Daniel said, “Hey, you wanna come do this together?”. The two chefs opened The Restaurant at Pearl Morissette in November 2017 in Jordan Station, Ontario.